A box of 100 x large 'C3 size' book wraps, also known as cardboard mailers. The size of these quality wraps is 311x240mm (length x width), and the depth is adjustable between 0-50mm. 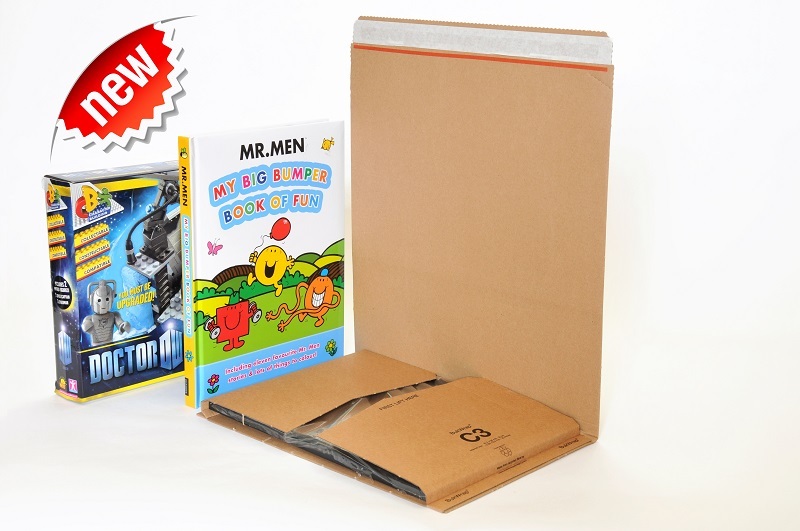 Perfect for a variety of uses, these are extremely high quality cardboard mailers manufactured in the UK specifically to help save on postage costs, while maintaining strength and durability during transit. The size of mailer represents the maximum 'large letter' size allowed for royal mail purposes, if sealed at less than a 25mm depth (max royal mail large letter size is 353x250x25mm). The weight of each mailer is 120g. They are the same mailers as used by Amazon for mailing out their books, and the original Bukwrap brand. All our book wraps contain 'peel & seal' strips with permanent strong adhesive for easy and efficient application and use.